FORT LAUDERDALE – The Florida Senior Games, presented by Humana, announced today a two-year partnership with the Greater Fort Lauderdale Convention and Visitors Bureau as its host for the 2019 and 2020 Games. The Games are Florida’s only Olympic-style sports festival for athletes age 50 and over. In 2019, the Florida Senior Games, presented by Humana, will field 24 sports over nine days, December 7-15. “We are honored to be the host destination for the 2019 and 2020 Florida Senior Games, and we look forward to welcoming senior athletes and spectators to Greater Fort Lauderdale,” said Stacy Ritter, CEO and President of the Greater Fort Lauderdale Convention & Visitors Bureau. In conjunction with Tuesday’s announcement, the National Senior Games also tabbed the Greater Fort Lauderdale area as its host for the 2021 National Games. 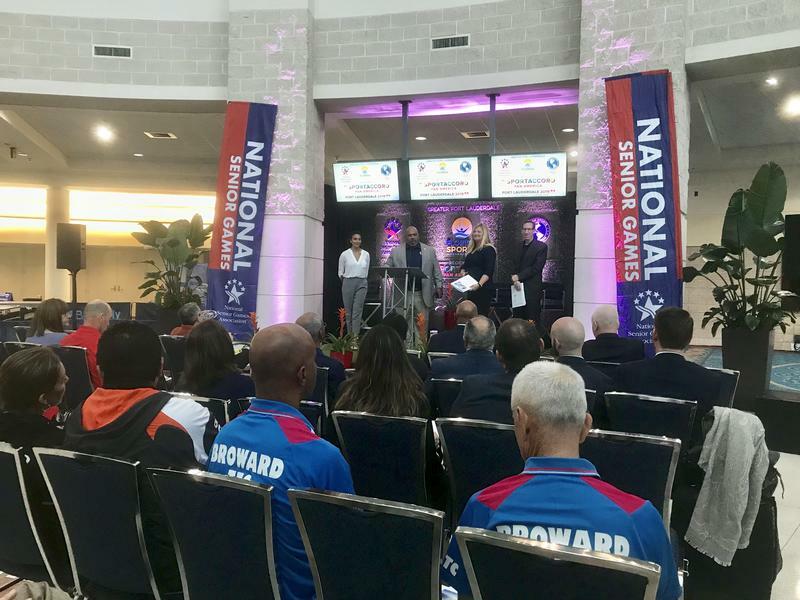 With the selection, Floridians and other competitors will have the opportunity to compete at facilities and venues that will be utilized throughout the Broward County area in the National Games during the 2019 & 2020 Florida Senior Games, presented by Humana. The Senior Games movement first started in Florida when the Golden Age Games were created in Sanford in 1974. Soon after, local and state level Senior Games events began appearing nationwide, especially throughout Florida. In 1988, the State of Florida appointed a task force to study the Senior Games where the purpose of the committee was to conduct an in-depth investigation on the status of the Senior Games movement in the state and determine what course to follow in the future. The committee determined that the time was right to bring all of the existing local Senior Games together. Combining the Games as a series worked to better serve the needs of the senior population regarding participation in local events and also provided an opportunity to standardize all the Games, thus leading to a State Championship. In 1992, the first Florida Senior Games State Championships were held in Bradenton. Over the years, the Florida Senior Games continues to grow, and together with the local games, provides fun, fellowship, fitness and competition for Florida’s fastest growing age group. The focus of the Senior Games is not winning but participating. Currently, the Florida Senior Games Series Qualifiers are under way as 21 opportunities to qualify for the 2019 Games are being contested statewide. A spring qualification (February through April) and fall qualification (September through November) period give athletes 50 years old and older multiple opportunities to compete and move on to the next level. For a complete listing of the 2019 Series Qualifiers, click here. While 2019 FSG events do not serve as a qualifier for the National Senior Games, the 2020 Florida Senior Games, presented by Humana, will. The Florida Senior Games are presented annually by the Florida Sports Foundation (FSF), the state’s lead sports promotion and development organization, and a division of Enterprise Florida, Inc. The Foundation works in conjunction with a variety of local sports industry partners to present the different competitions. The Florida Senior Games, an annual amateur sports tradition in Florida, is part of the state’s $57.4 billion sports industry that accounts for 580,000 jobs statewide.